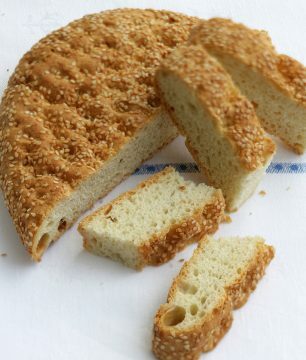 Lagana is the unique Lenten flatbread that is traditionally eaten on Clean Monday, the start of the 40-day Greek Orthodox Lenten fast. The fast, indeed, is a paradigm of the Mediterranean diet and most of the dishes eaten during this 40-day period also offer a great, delicious option for vegans and vegetarians. 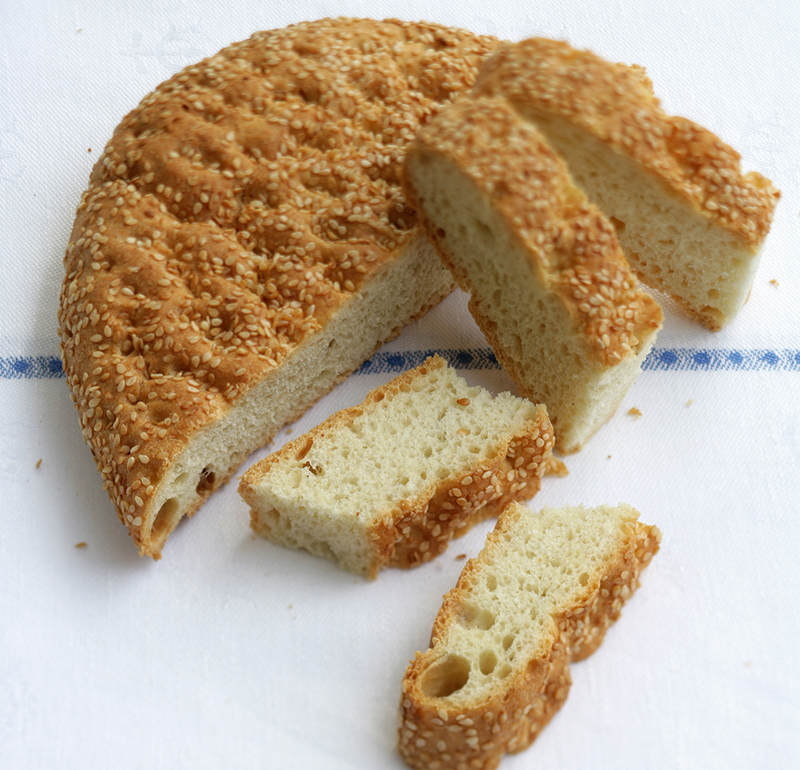 Traditionally, lagana is made without yeast, a true unleavened bread, like those mentioned in the Old Testament. Lagana is NEVER cut with a knife but rather broken apart, because iron, the stuff of knife-making long ago, was believed to contain the powers of evil. Few people make the bread at home anymore, relying instead on local bakeries in Athens and throughout Greece. It’s an all-night baking process, one punctuated by glasses of retsina, bowls of pickled vegetables and wedges of “Makedonikos” halvas, made with tahini. These are the Lenten treats bakers sustain themselves on while preparing these oversized, flat loaves. It’s thought that the word, probably from laganum, the batter-based griddle breads made on hot stone in ancient Greece, might be the precursor to the flat, wide pasta shape, lasagna. Few bakers today make the bread without yeast, simply because it’s too much trouble and take too long. At least one Greek community I know of in the United States, the Hellene Cuisine group at the Annunciation Cathedral in Baltimore, prepares lagana loaves for sale to its parishioners. You can also find it at Artopolis in Astoria.